ELLICOTT CITY, MD (October 1, 2013). 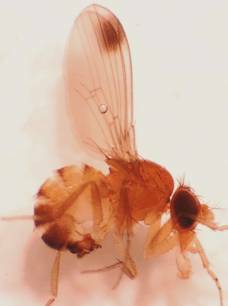 Spotted wing drosophila (SWD), Drosophila suzukii, is an invasive, destructive pest, originating from Southeast Asia. It has recently been found in Maryland infesting blackberries and raspberries. SWD’s appearance in Maryland is why the Maryland Invasive Species Council has named it the Invader of the Month. What makes the SWD such a devastating pest is that it attacks undamaged, ripe or unripe fruit. Damage to fruit can affect marketability and crop yields. This pest originated in Eastern Asia and was first found on the west coast of the United States in 2008. In 2010 it was found in the Mid-West, Florida, and Pennsylvania primarily in strawberry or grapes. The rapid spread through the country was most likely due to human intervention. The adult SWD looks like many other Drosophila species (also called vinegar flies) that attack rotting fruit. Adults are small (2-3 mm) flies with red eyes and a pale brown body with black stripes on their abdomen. The most distinct trait of the adult males is a black spot towards the tip of each wing (Photo 1). Females DO NOT have these spots, but instead have a dark serrated ovipositor with 2 rows of prominent teeth that they use to cut into fruit and lay their eggs. The ovipositor can only be correctly identified by using some magnification (at least 10x). Juvenile SWD are very small clear or white maggots that are found in the fruit. Basic traps can be made from plastic containers, drilling ¼” holes into the plastic containers on the sides so the adult flies can enter easily. Drill the holes on the sides just below the cap. A small amount of fruit vinegar such as apple cider vinegar will attract the adult flies. About an inch of liquid is enough to last about a week in most situations. The small hole size will exclude many bigger insects but realize you may pull in other small bodied insects along with the SWD. In a trial at Michigan State University it was found that traps baited with a yeast and sugar solution caught more SWD early in the season. Whichever mixer you use add a drop of two of liquid detergent to reduce the surface tension so the flies will drown in the solution. The traps should be hung in the shade, in areas where susceptible fruit is being grown. For strawberry plants hang the traps about 12” from the ground. Weekly monitoring during the growing season is necessary to detect the first SWD activity. Check the traps weekly, and pour the liquid from the container through cheesecloth like fabric or nylon hoses to collect the insects. The captured insects will need to be slightly air dried before examination. The males have distinct spots on the wings and if your vision is 20/20 you should see this easily. A hand lens may be needed to see this for anyone with less than 20/20 vision. The female SWDs have features that are harder to distinguish. The females do not have spots on the wings. Once adult flies are detected, fruit can be sampled using a salt solution that forces larvae out of the berries. Make a solution of 2 cups of sodium chloride (table salt) mixed in 1 gallon of water. The fruit is harvested and placed in this solution in a container. Larvae will exit the fruit and will be visible on the surface of the fruit. You are welcome to send samples to us at the CMREC labs (11975 Homewood Road, Ellicott City, MD 21042) for identification. photo available electronically on request. Invader of the Month insects. permalink.